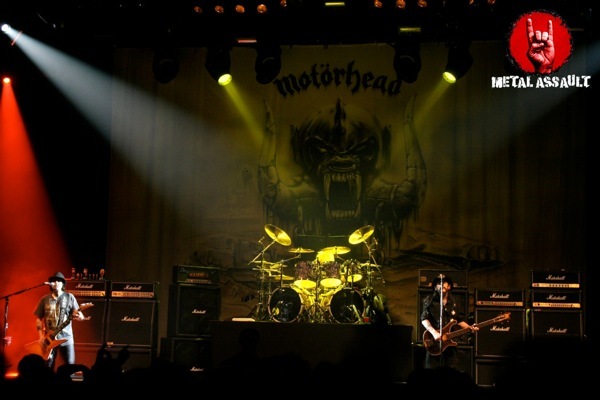 April 11th 2014, Club Nokia, Los Angeles CA: In terms of releasing new music, rock ‘n roll godfathers Motörhead have always been prolific and consistent, and they managed to keep these traits intact with the release of their 21st studio album ‘Aftershock’ last October. But when it came to playing shows and going on tour, they were forced to cut back massively as a result of frontman Lemmy Kilmister’s deteriorating health. 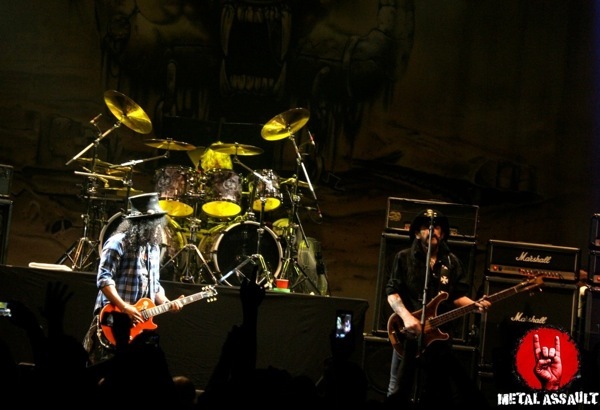 But finally, with Lemmy sufficiently recovered, the band went ahead and booked a handful of shows around their Coachella appearance, starting off with a headline show at Club Nokia in downtown Los Angeles, a venue they’ve frequented in recent years. 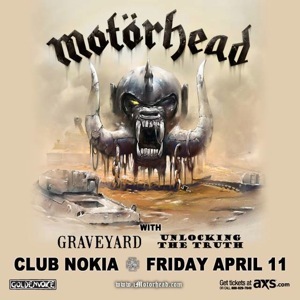 The common consensus being this could be one of the very last full Motörhead shows in LA, it was sold out as early as 3 PM on the day of, and along with support acts Graveyard and Unlocking The Truth, Motörhead took the stage in front of a packed house. 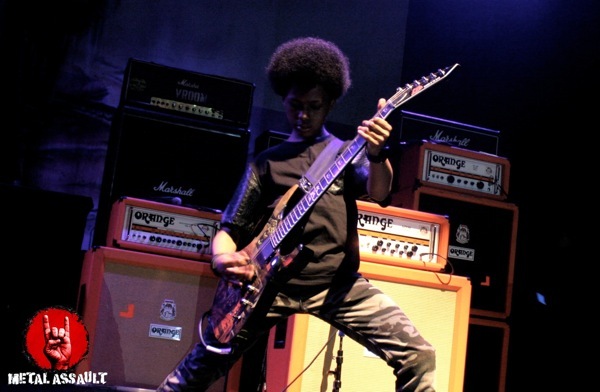 Doors opened at 7:30, the LA metal horde flocked in, and the show began promptly at 8:30 with Unlocking The Truth hitting the stage with an impressive 30-minute set. This is a band made up of three Brooklyn NY-based 7th grade kids, the first sight of whom naturally took everyone in the audience by surprise, but during the course of their set they genuinely succeeded in turning heads and capturing the attention of the crowd who gave the band a positive response. Their music came across as a salute to old-school metal that also blends modern influences, and their instrumental passages were more enjoyable in my opinion, with a solid guitar tone and the three members combining together excellently. They seemed very comfortable on this big stage, even at their age. With gigs such as these, Unlocking The Truth are well on their way towards unearthing some real potential. 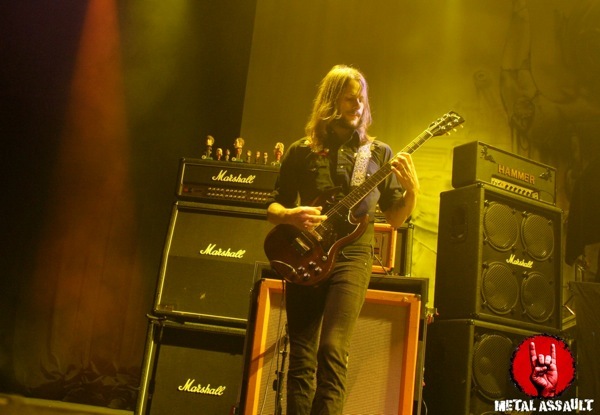 Shortly after, Swedish quartet Graveyard came on to deliver their brand of psychedelic hard rock, presenting material from all three of their studio albums in a 40-minute set that pleased fans of the vintage rock sound. The undeniably dynamic set ranged from groovy foot-stompers like “Ain’t Fit To Live Here” and “Buying Truth” to fast-paced rockers ‘Hisingen Blues’ and ‘Goliath’, and had its fair share of slow, bluesy psychedelia with the influx of tunes like ‘Slow Motion Countdown’ and ‘The Siren’. As expected, some in the audience weren’t quite able to appreciate Graveyard’s music and there were a few catcalls, but I thought they proved to be a great fit for this show, presenting a style of music that’s so markedly different than Motörhead’s, yet so similar in principles. The pristine nature of Graveyard’s musicianship shines through even more in the live setting than it does on their albums, and the odd equipment issue aside, this set was a true representation of that. With their latest album ‘Lights Out’ almost two years old, one can expect the band to work on new material this year and spread the gospel of the genre even further. With that, the two opening acts were done and it must be said, the combined efforts of Graveyard and Unlocking The Truth provided far greater entertainment to this audience in comparison to the horrendous openers Motörhead had at this venue last time. At 10:35, the lights went out, and in their typically nonchalant manner, the three members of Motörhead appeared on stage. “Let’s start this thing before I drop dead!”, said Lemmy, and the band laid into a smoothly flowing 75-minute set laden with classics and deep cuts along with a small dose of newer material. In all honesty, Lemmy’s vocals sounded really weak on the first four songs and at that point I was genuinely worried about whether he’d be able to pull through this entire set. But much to the relief and delight of everyone present here, he powered through. It was during the fifth song ‘Over The Top’ when his vocals gained strength and he was able to carry himself through the rest of the set to deliver a show of the kind of quality that would be generally expected of a Motörhead led by a fully healthy Lemmy Kilmister. ‘Lost Woman Blues’ was the song chosen to represent the latest album ‘Aftershock’, which turned out to be a great pick as it highlighted the clean, tender facet of Lemmy’s vocals and the bluesy goodness of Phil Campbell’s guitar playing. Vocally and musically, this was perhaps the best song of the set and was slotted perfectly between ‘Rock It’ and ‘Dr. Rock’. This 15-song Motörhead set featured three changes from the set they played at the same venue nearly a year ago, and overall, this one felt like a better show than last year’s. To make things even better and more memorable for the attendees, the iconic Slash joined Motörhead for an encore performance of the band’s two biggest hits ‘Ace Of Spades’ and ‘Overkill’ and added some sweet guitar leads with his usually effortless disposition. The crowd was in full-on insane mode for the entirety of the set as the mosh pits never stopped, and this rendition of ‘Overkill’ complete with Slash and a giant wash of strobe lights flickered throughout the song, took the atmosphere to a crescendo and proved to be an apt way to close out the show. 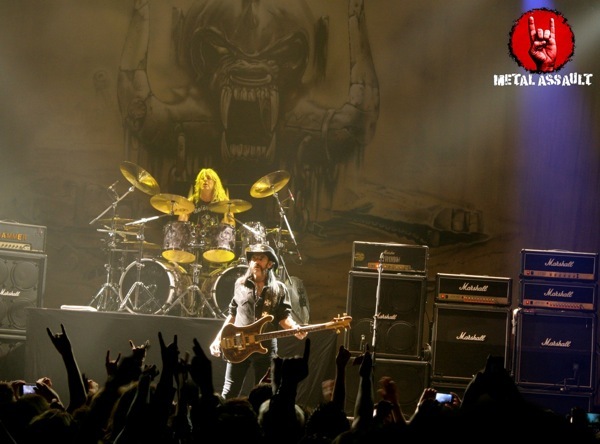 The fans’ focus was on Lemmy as it always has been, but credit must be given to his often unheralded band mates Phil Campbell on guitar and Mikkey Dee on drums who seemed to put in a stronger effort than in the past, perhaps to compensate for Lemmy’s illness and to ensure that the show is still as ear-shatteringly loud and righteously rocking as every Motörhead show of the past. They’ve been in the band for 30 and 23 years respectively, and it’s high time they got the respect they deserve as they’re undoubtedly great musicians in their own right. All in all, this Motörhead show was better than I honestly expected, and attendees who forgot to wear earplugs will be fighting deafness for the remainder of the week, if not longer. In terms of the opening acts, the set list, the encore, the crowd, and just about every other aspect imaginable, this show topped Motörhead’s previous LA gig, and if it indeed turns out to be the last time LA gets to see a full Motörhead set, it’s certainly a great show to remember them by.